The other evening I had the pleasure of attending the RSA and “1970 Club” even where Sir Martin Holdgate CB gave the lecture on “The World Environment in 2070”. This would be a difficult topic for most to give a credible story but Sir Martin did it with aplomb. I agreed with probably most that he said, but could quibble on a few important points but chose not to. I was keen to ask a question and I had the unique opportunity to get my question in last. Sir Martin was taken aback by this question and was unable to answer it other than to say it was “profound”. He promised to think about it over the evening. He did and we had a chat after dinner. Quite a few people came up to me and gave me their ideas. At the time I could think of two decisions I think deserve consideration. What do you think? I’ll comment here in coming days. I’ve attended a few meetings/dinners recently which covered different topics but climate change risks were at the heart of all. The speakers and audience at all these events were well informed and involved in the issues either on a professional level, e.g. government policy makers, politicians, investors, academic, or just plain-interested. The main thrust is alway about how upcoming man-made climate change is the biggest challenge man has ever faced. Proof that this is the case is presented in various ways–last night someone recounted the horror of seeing “with my own eyes” polar bears running out of ice in the Arctic. I consistently heard how CO2 is a “greenhouse” gas and how this has been known for more than a hundred years and is therefore “fact”. I also hear how there is faith and expectation in our ability to “significantly” increase the efficiency of our energy generation, especially from wind power. It is asserted by getting those efficiency gains, we can both significantly reduce CO2 emissions and get more energy, thus supporting the current massive investments in alternative energy so as to avoid the atmospheric crisis. This all jars with with I was forced to learn at my Tuesday/Thursday/Saturday at 7:30 a.m. course at university on Thermodynamics. While I was probably mostly asleep at these classes, I did attend, and I distinctly remember being confused about and awed at the Laws of Thermodynamics. One point that sticks in the back of my mind was a lot of discussion about how it is required to have wasted heat in energy generation and to have no “waste” heat means no power can be generated. I didn’t quite get it then; but I want to get it now. Maybe I’m remembering wrongly? Time to action my to-do item on re-learning “thermo”. Cleaes Johnson, a professer in Sweden has been blogging about for quite sometime that there is no science (based on thermodynamics) which supports “CO2 alarmism”. Professor Johnson, in a blog post at provides the catalyst to get me going. He kindly provides links to two documents: “Thermodynamics of the Atmosphere”, and “Computational Thermodynamics”. Being the techy that I am, I’m going to start reading and remembering “thermo” the best I can and see if I can un-jar these ideas. On a most enjoyable cross-country train today. So much better than airplane travel, save but the “loud-talkers” on mobile phones. Roger Pielke Jr has a great posting which comments on the testimony of Michael Oppenheimer from Princeton University and coordinating lead author of the IPCC special report titled Managing the Risks of Extreme Events and Disasters to Advance Climate Change Adaptation, to the Select Committee on Energy Independence and Global Warming of the US House of Representatives. He takes issue with Oppenheimer’s assertion that “assignment of cause for the damaging outcomes of such extremes” is a relatively new field. In suggesting that this is a “new” field he notably avoids discussing a large body of literature such as on tropical cyclones (in the US, Australia, China, India, Latin America, etc. ), floods, European storms, Australian bushfires, etc. where peer reviewed work has explained damage trends solely in terms of increasing societal vulnerability. Why is it so hard for IPCC authors to acknowledge any of this literature? I like that. Good question. I’m going to dig out my text books to find out when this field of extreme events became “mature”, but in the 1970’s we learned all about environmental “extreme” events like flooding in my undergraduate and graduate courses in Hydrology. We learned that the probability distribution of many extreme events could be reliably be modelled using the Gumbell Distribution. For homework, we gathered data on “extreme” floods, wave heights, etc. and plotted those events on Gumbell Distribution probability paper (we didn’t have Excel in those days). The data usually lined up in a straight line which enabled us to extrapolate to longer periods of time than for which we had data. For example, we could take fifty years of real data on maximum river levels and use that data to extrapolate to the 100, 500, or even 1000 year flood. That would then provide a basis up which to design flood control structures. I learned at my first corporate job that Gumbell distribution also worked well with maximum ocean wave heights. All that before the IPCC existed to tell us what we don’t know. This is a posting I’ve been thinking I should write for quite some time. 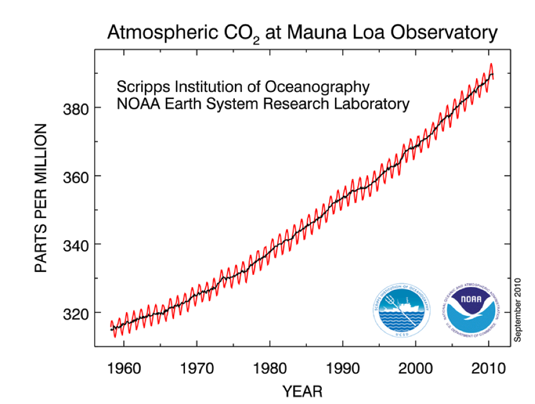 I’m prompted as I again saw this graph of CO2 in parts per million, as measured at the Mauna Loa Observatory in Hawaii since the 1950’s, used this week at the Royal Society of Edinburgh by the Lord Kreps. 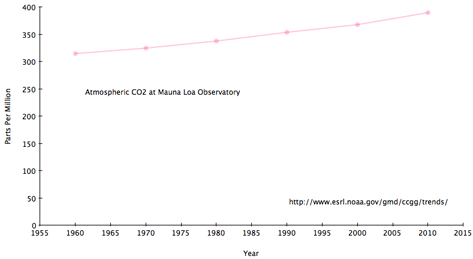 The first graph is as published by NASA where they show vertical scale from about 315 to 400 parts per million. The second graph, based on “cherry-picking” the annual numbers, is on a scale from zero to 400 parts per million. When one is told before seeing this graph that we have a problem with carbon and then we see the first graph, the concern is pretty much “proven” without discussion. If one were shown he second graph would not be more difficult to support the “problem” assertion? Neither graph shows the “ideal” number of carbon molecules we should have in parts per million, probably because nobody knows. All this reminds me of that great book “How to Lie with Statistics“. This evening I attended the Royal Society of Edinburgh’s lecture on “Facing Up to Climate Change” presented by The Lord Krebs Kt, FRS, FMedSci, Principal, Jesus College, University of Oxford. He’s also a member of the House of Lord’s Committee on Climate Change. : the climate is changing–the proof is clear: rise of sea level, flooding, ocean acidity, etc. It’s going to get hot, and hot is bad (extreme weather, uninhabitable regions of the world, etc.) And all this is caused by mankind. : the key to solving this “problem” is to change mankind’s behaviour to stop the climate changing. : government’s role is to ensure people to change their behaviour–probably via non coercive methods, e.g. psychological, because to do otherwise is politically impossible. : buying “stuff” (consuming) does not lead to happiness and if mankind stops “unethical consumption”, the horror of climate change will be prevented. You are currently browsing the Musings on Interesting Things blog archives for September, 2010.